Pre-wedding we were kept busy with last minute prep. Post wedding it hasn't actually got any less busy. Straight after the wedding we took a 5 night mini-moon trip to Scotland after deciding to have our proper honeymoon later in the year. Originally we had thought about going snowboarding but being a couple without kids we realised as we tried to book something that the week after the wedding was actually half term therefore everything was super expensive. Instead we travelled up to Glasgow on the train to pick up our hire car and drive to Loch Lomand. The drive took us up through some beautiful scenery before arriving at the Lodge on Loch Lomand - our home for four nights. We had a room with an amazing view of the Loch as well as our own private sauna, which we took advantage of straight away as well as the bottle of champagne mum had kindly arranged to be in our room on arrival. We took the car out a couple of times to explore the local area including a walk up to Sloy dam and a drive past Faslane where the trident submarines are based (only realised we were there when we drive past a protest camp). We returned to Glasgow for our final night and checked into the Grand Hotel in the station. We then headed to meet Andy's cousin William for some snowboarding at the indoor centre. Now, I have snowboarded more than Andy and we chanced our luck at getting on the slopes despite not having been on a board for 3 years. First problem, I had no idea how to use the lift. 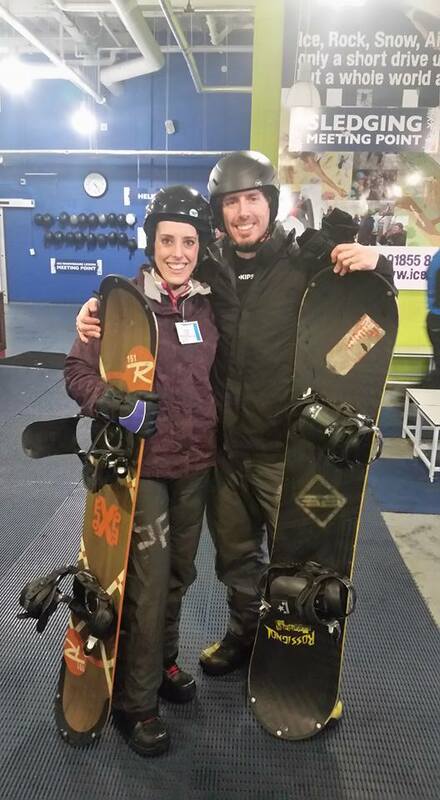 I face planted a lot while Andy got on and travelled up the slope first time. As it took me a while to get up the slope, Andy decided to head off on his own. He was doing really well until he was cut up by two small children, turned sharply and landed heavily on his shoulder. It cut his session short as he went off to see his cousin who thankfully is a paramedic. I continued to face plant on the lift but made it up eventually and after some help from the lovely guys operating the lift I had got the hang of the lift by the end of our session. Some German beers and food later and we travelled back to town to end our night in BrewDog Glasgow (another BrewDog bar and ticked off the list). Then the fun and games. We headed back to the hotel. I had been suffering all week with the remnants of the illness I had acquired the week before the wedding but now Andy was starting to feel ill too and his sprained shoulder was also making him feel worse so we headed to bed. At 2am we woke with a start as the fire alarm sounded in our room. At first we thought it would stop pretty soon as it was likely to be a false alarm but instead it continued. We got dressed, Andy will difficulty due to his injury, and made our way downstairs and to the street outside the hotel. Andy couldn't get his boots on so had opted to wear the free slippers the hotel provided. He wasn't the only one, but at least he had put on clothes and a jumper which was a good call considering it was a February night in Glasgow. We waited outside for over an hour as the fire brigade arrived to check the hotel over. Eventually we were allowed back into the building. The cause - drunk person from the party in the champagne bar had got lost and trapped in a fire escape and had set the alarm off trying to get out of the building. Back at the room my cough had come back with a vengeance meaning sleep alluded me for another hour before finally nodding off. We had an early start in the morning due to the line between Glasgow and Carlisle still being repaired following the floods at Christmas. More annoyingly the line was re-opening on the Monday. Feeling shattered in the morning we boarded our train and then headed back to London.We were a bit shattered when we returned to London but it was worth it. It's another part of Scotland I have now explored and a fantastic break post wedding. And on the plus side we still had the main honeymoon to come!